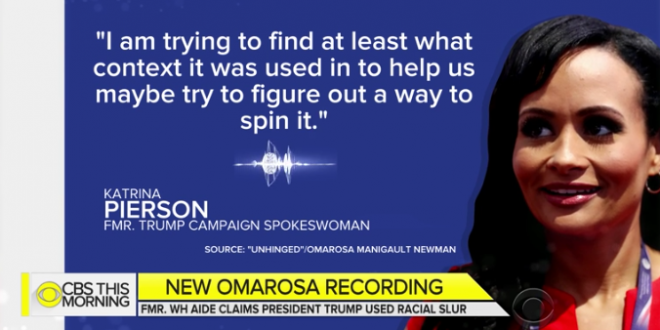 Omarosa Releases Tape Of Trump Aides Discussing How To "Spin" Fallout From Trump Saying N-Word [VIDEO] - Joe.My.God. But a new recording, obtained by CBS News overnight, seems to back up Omarosa’s story that several Trump advisers discussed an alleged tape during the 2016 campaign. In her new book, “Unhinged,” Omarosa claims the Trump campaign was aware of the existence of the tape. She describes an October 2016 phone conversation with Lynne Patton, then-assistant to Eric Trump, spokesperson Katrina Pierson and campaign communications director Jason Miller in which they discuss how to deal with the potential fallout from its release. Last night Pierson appeared on Fox News to flatly deny the existence of the tape which you can hear for yourself below.